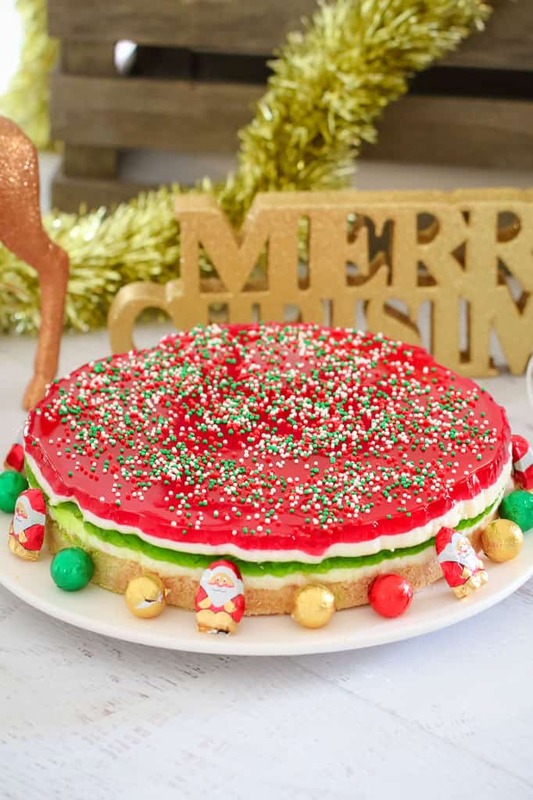 This really is the BEST Christmas Jelly Cake ever… with 5 pretty layers that make it the perfect no-bake Christmas dessert! 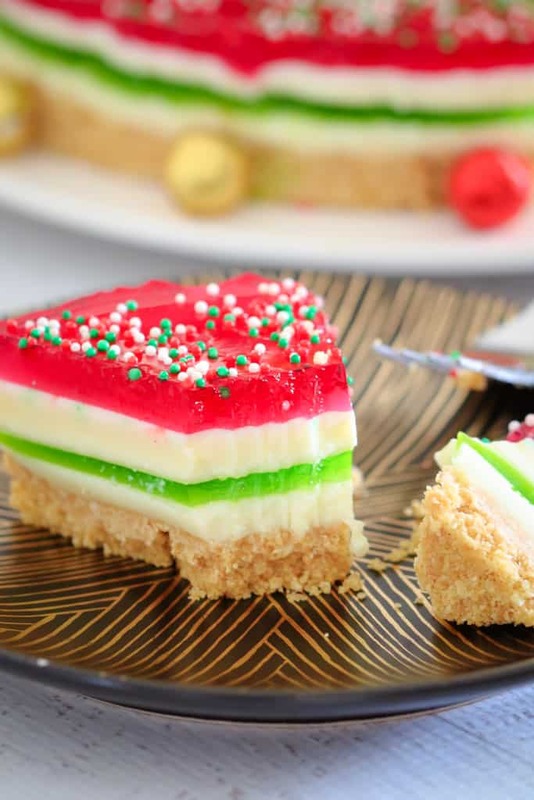 Just like a traditional jelly slice… but with a Christmas makeover! Is there actually anyone in the world who doesn’t love jelly slice??? It is the BEST! 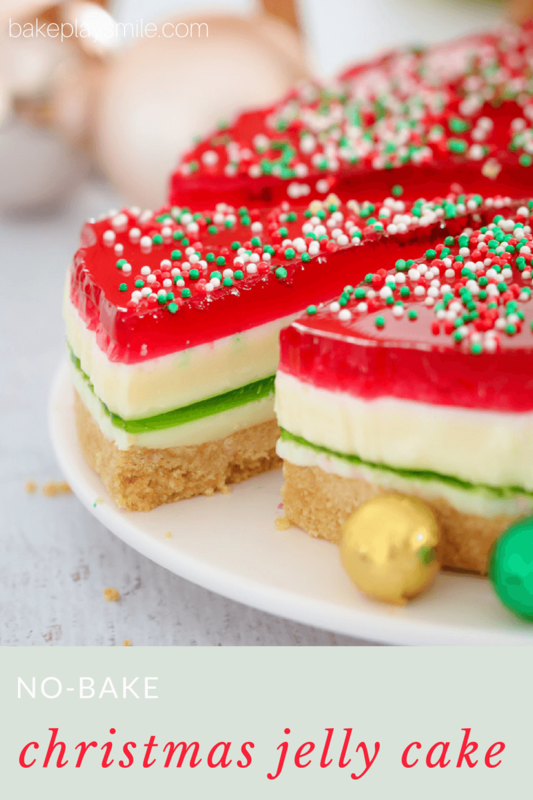 Layers of a crunchy biscuit base, creamy filling and jelly top… it doesn’t get any better than that. Well until now, that is!! 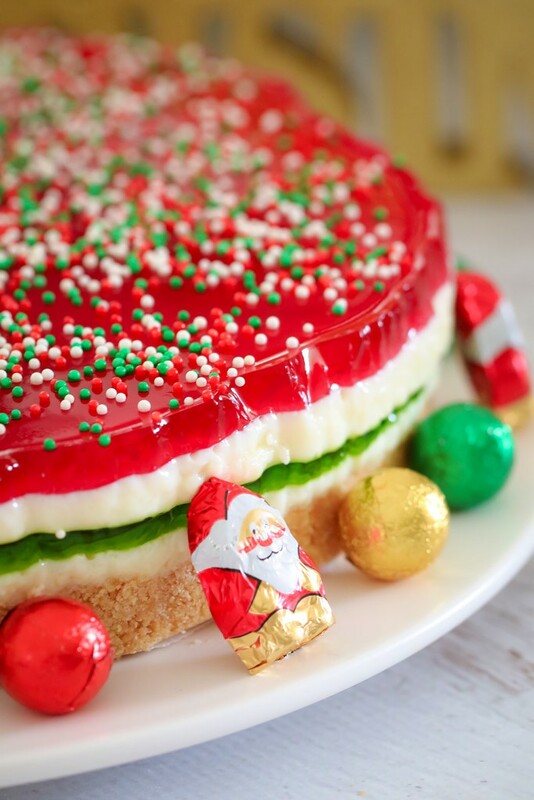 Introducing the BEST ever Christmas Jelly Cake. This takes the classic favourite to a whole new level. I’m talking 5 layers of Christmassy-festiveness-deliciousness. This no-bake dessert is going to take your Christmas party up a notch in the yumminess-factor (that’s totally a thing!). Plus it’s super easy to make (you just need to have a little bit of time on your hands and also prepare it the day before). And please, please don’t be freaked out thinking that 5 layers = a tricky dessert. Nope, not at all! Each of the layers will take you just a couple of minutes to prepare. The time consuming part is just waiting for each of the layers to set!! 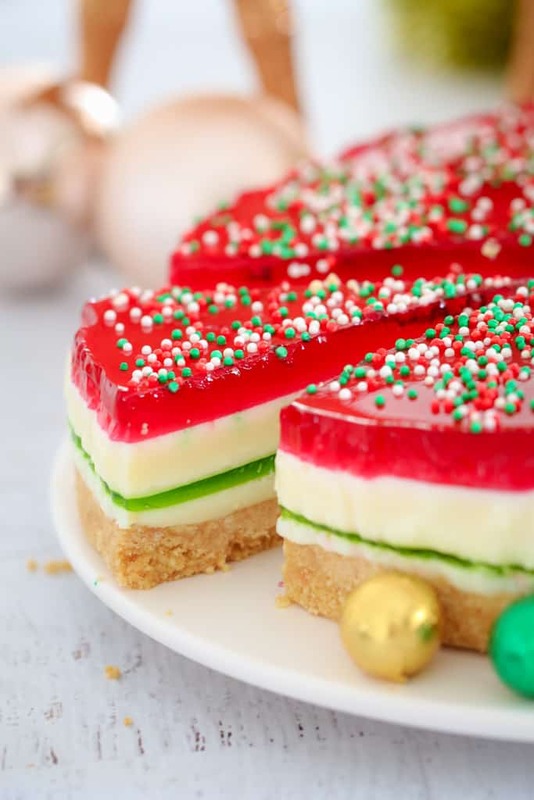 So please promise me you’ll add this Christmas Jelly Slice to your must-make list. It’s a guaranteed winner with kids (and adults!!). 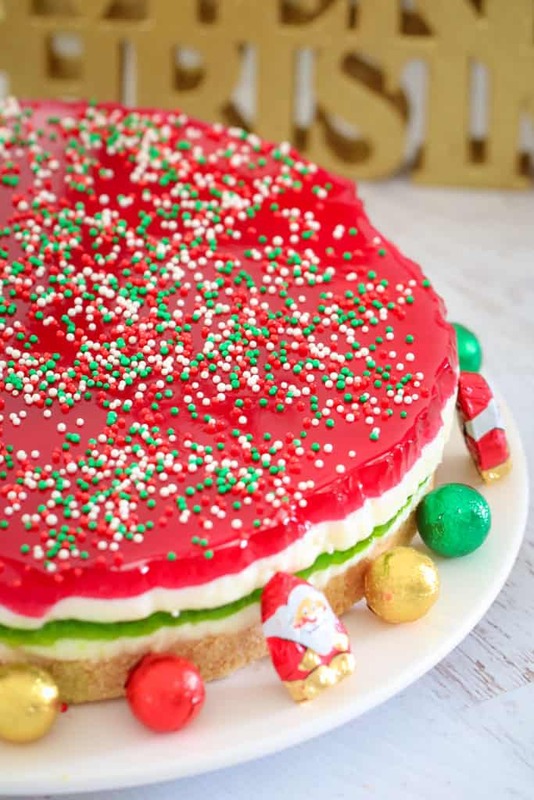 This really is the BEST Christmas Jelly Cake ever... with 5 pretty layers that make it the perfect no-bake Christmas dessert! 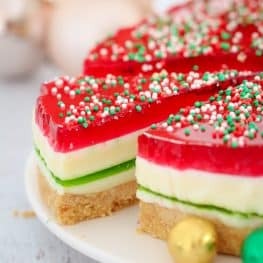 Just like a traditional jelly slice... but with a Christmas makeover! Grease and line a 23cm round springform tin with baking paper and set aside. Make the green jelly according to the packet instructions and set aside on the bench to cool - do not place it in the fridge as you don't want it to set just yet. Crush the biscuits in a food processor and place into a separate bowl. Add the melted butter and mix until well combined. Firmly press the mixture into the bottom of the prepared tin and then place it into the fridge. Dissolve gelatin powder in the cold water (see notes section). Place the condensed milk and lemon juice into a separate bowl. Add the dissolved gelatine mixture and mix until completely combined. Pour the mixture over the prepared base and place into the fridge until set. 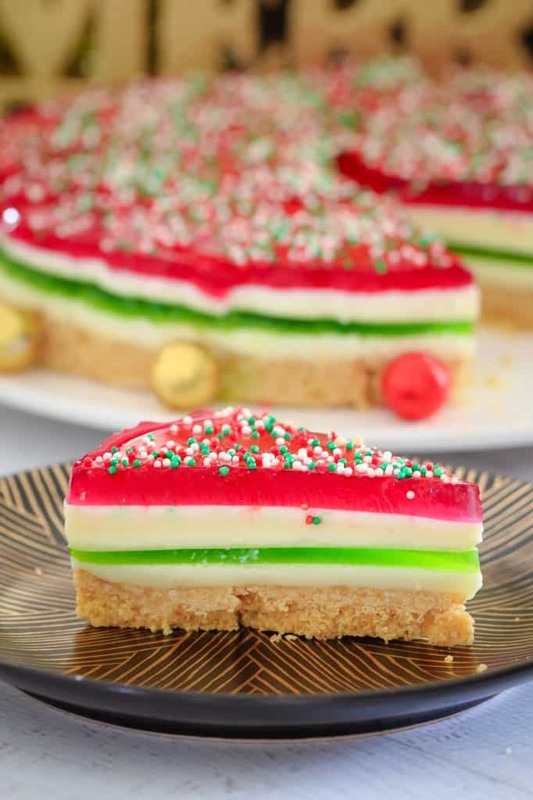 Gently pour the cooled green jelly over the top of the slice and place into the fridge until set. Make the red jelly according to the packet instructions and set aside on the bench to cool - do not place it in the fridge as you don't want it to set just yet. Carefully pour the mixture over the set green jelly and place back into the fridge until set. Gently pour the cooled red jelly over the top of the slice and place into the fridge until set. This recipe needs to be made the day before as it takes quite a bit of setting time for each layer. Ensure each layer is set before preparing the next layer. To dissolve your gelatine powder, sprinkle it over 1/4 cup of cold water in a small bowl and allow it to sit for a minute or two. Place the cold water bowl (containing the gelatine) into a larger bowl filling with boiling water and allow it to slowly warm up (while stirring). Place the butter into the Thermomix bowl and melt on 80 degrees, Speed 2, 2 minutes. Add the biscuits and press Turbo until crushed and combined (you may need to scrape down the sides of the bowl partway through). Place the condensed milk and lemon juice into a clean Thermomix bowl. Add the dissolved gelatine mixture and mix on Speed 4, 15 seconds. 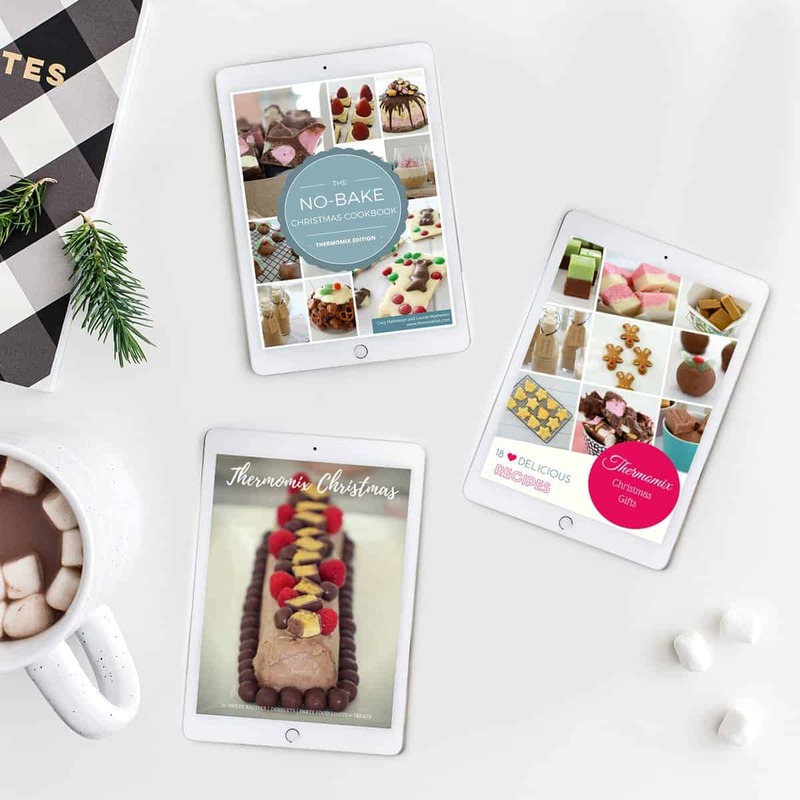 Please give us the option of a simple print – not just share – much easier to have a hard copy on the kitchen bench! Hi Prudence, I’m sorry I don’t think I understand what you mean? You simply click the ‘print’ button on the recipe card and it will print out for you? Hmm that’s very weird. I’ve just clicked the print button and it’s worked fine for me! Perhaps your browser settings are blocking it? Fantastic Jenny!! The strawberries are a lovely idea! I made this for our family Christmas and it turned out amazing and everyone said how great it looked and tasted. Your instructions were super easy to follow for a first ever attempt at Jelly slice and I had no trouble printing. Thank you so much.